Some aspects of the trial may warrant closer scrutiny before clinicians begin to change practice patterns. 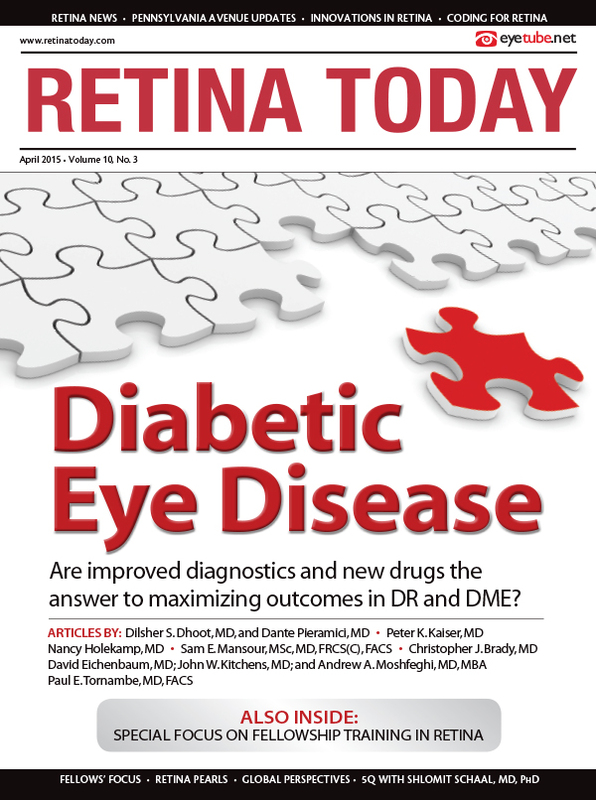 The results of the DRCR.net Protocol T study have been released to the retina community,1 but some features of the study may affect how the results are interpreted, whether they are generalizable to clinical practice, and what they truly mean in the context of data from previous trials of anti-VEGF agents in patients with diabetic macular edema (DME). There was no statistically significant difference in letters gained among the treatment groups in patients with baseline visual acuity between 20/32 and 20/40 (8.0 with aflibercept, 7.5 with bevacizumab, and 8.3 with ranibizumab) but there were statistically significant differences in gains at 1 year among the treatment groups in patients with 20/50 or worse baseline visual acuity: “18.9 [letters] with aflibercept, 11.8 with bevacizumab, and 14.2 with ranibizumab (P < .001 for aflibercept vs bevacizumab, P = .003 for aflibercept vs ranibizumab, and P = 0.21 for ranibizumab vs bevacizumab),” according to the study authors. The results are important for understanding of how effective anti-VEGF agents are for treating DME. Yet clinicians may want to use caution in interpreting the results before changing practice, according to Marco A. Zarbin, MD, PhD, chairman of the department of ophthalmology and visual sciences at the Rutgers New Jersey Medical School. In an editorial accompanying the Protocol T publication, Daniel Martin, MD, and Maureen Maguire, PhD, argued that the results of the study were substantial enough that clinicians should reconsider how they use anti-VEGF agents front line. They suggested a bifurcated treatment strategy according with the findings from the Protocol T study, namely that patients with 20/40 or better vision should receive the cheapest option (bevacizumab), while more expensive drugs should be reserved for later in the disease course or for patients who do not respond to initial therapy. “Because there were no significant differences in safety or efficacy among drugs in patients with this presenting visual acuity, cost becomes a major consideration in choosing therapy,” they wrote. However, basing treatment decisions solely on visual acuity may be questionable in light of the anatomic outcomes in Protocol T, and given that the bevacizumab used in the study may not be functionally equivalent to what is used in clinical practice, Charles Wykoff, MD, PhD, of Retina Consultants of Houston, pointed out in an interview with Retina Today. The bevacizumab used in Protocol T was compounded into glass vials under scrupulous conditions, Dr. Wykoff noted. Yet clinicians in the United States and elsewhere typically receive compounded bevacizumab in plastic syringes, and “there is good data that the quality of the bevacizumab in a plastic syringe may be variable and may be different than bevacizumab delivered in a glass vial,” he said. Dr. Wykoff agreed that barriers restricting patient and physician choice are problematic, and he pointed out that one of the many barriers to be addressed is that bevacizumab is not widely available to clinicians in the same fashion as was studied in Protocol T.
“I agree that all barriers that prevent patients from getting the best vision and the best outcomes should be broken down. One of those barriers may be access to bevacizumab for many reasons, including access to the bevacizumab that was used in the trial, which many retina specialists around the world do not have. If there are proposals that patients should receive bevacizumab first line, ideally we would have data that the bevacizumab we use in the clinic is biologically equivalent to the bevacizumab in clinical trials that drive those recommendations,” Dr. Wykoff said. Beyond the access question, however, is whether basing treatment choice on visual acuity alone is sufficient in the management of DME. The anatomic differences at 1 year in Protocol T between bevacizumab, ranibizumab, and aflibercept were significant, with bevacizumab performing consistently worse that the other two drugs among all patients and in all subgroups. According to Dr. Wykoff, data from the VIVID, VISTA, RISE, and RIDE studies highlight the fact that earlier treatment leads to better outcomes, suggesting that chronic central fluid may be damaging to the retina, and thus may limit the potential for visual gain. Therefore, in the clinical setting, it may be more appropriate for physicians to consider using whichever agent might achieve the best anatomic and visual outcomes for the individual patient. Another potentially limiting barrier to the use of bevacizumab as first-line therapy is whether physicians can plausibly use the medication in patients with DME. The ability for physicians to have access to bevacizumab discretionally may be determined regionally, and thus a global treatment policy suggesting first-line bevacizumab may be inherently problematic. Requirements for patient-specific prescriptions for bevacizumab—which is a policy in place or under consideration by federal authorities and several states—may create a practical patient compliance barrier to using bevacizumab. In some disease states, such as age-related macular degeneration (AMD), immediate treatment with an anti-VEGF agent may be more urgent in terms of the visual outcome. In DME, there may be more latitude with regard to the visual impact of the disease, and, thus, asking a patient to return for an injection at a later date may not be as visually consequential as in AMD. However, in real-world clinical settings, patients with DME are a subset of diabetic patients, a group with a notoriously high rate of health care needs due to their systemic disease, and also potentially with poor adherence to medical follow-up. As a consequence, DME patients may not consistently follow up with their retina specialists (ie, they may not return to receive an anti-VEGF injection), especially because the visual consequences may not be as apparent at the onset of their disease. Thus, the initiation of treatment may be delayed months or even years—possibly not until potentially irreversible visual sequelae start to become noticeable to the patient. “Logistically, getting DME patients to return to the clinic because of requirements for a patient-specific prescription could be a major obstacle, especially because many diabetics are in the working-age population and they have a job. They may have to take time off from work every time they come in for an ocular treatment,” Dr. Wykoff said. Other real-world scenarios may also bring into question the generalizability of the Protocol T study results. For instance, Dr. Wykoff pointed out, patients in the trial were treated on what he termed a modified PRN strategy, wherein patients initially received treatment for 6 consecutive months unless protocol-defined stability was reached (defined as not improved or worsened by at least 5 letters for at least 2 injections), and vision was 20/20 and their optical coherence tomography (OCT) showed no substantial central DME. After 6 months, injection was deferred if the patient had less than 5 letters of change in visual acuity and less than a 10% change on OCT at two consecutive visits, even if the OCT demonstrated DME. Regardless of how reflective the PRN strategy in Protocol T is of real-world practice, patients in the trial received a mean of nine to 10 injections in the first year of the trial irrespective of treatment group. On the one hand, this fact exemplifies that good outcomes are achievable but with a high number of anti-VEGF injections. Yet patients in the real world often do not receive that level of treatment, even in their first year of care when treatment is often maximized. Another aspect of the high number of injections in Protocol T relates to patient access. In an era when insurance companies and payers may wish to limit treatments if they carry a high price tag, how free will doctors be to continually deliver anti-VEGF agents at their discretion? Will they be fully reimbursed if they provide nine to 10 injections per year? More important, will patients be allowed by their insurers to receive that many potentially costly injections? “That is an important issue, especially in an era of cost containment: Patients on average need a lot of injections to achieve good outcomes, especially in the first year of treatment. And, many doctors are acutely aware that their prescribing habits are carefully tracked and publicly available,” Dr. Wykoff said. Scientific studies are judged based on their reproducibility. This is a prime reason why regulatory bodies such as the US Food and Drug Administration require multiple studies in registration trials. Within the context of DME, aflibercept gained approval based on the findings of the VIVID and VISTA trials, and ranibizumab based on RISE and RIDE. Importantly, there were similarities in the visual and anatomic outcomes of VIVID and VISTA and of RISE and RIDE, enough that a case could be made that the results in each arm of each trial were valid. The Protocol T study demonstrated a significant difference in visual acuity outcomes among patients with poor entry vision (worse than 20/50 or 69 letters). According to Dr. Zarbin, this finding is important in its own right, but should be understood relative to how patients with poorer baseline vision fared in other major clinical trials. For example, Dr. Zarbin pointed out that in the VIVID and VISTA and RISE and RIDE registration trials, there were reproducible visual acuity outcomes among patients with BCVA between 20/40 and 20/160 at the time of enrollment into the study. In VIVID and VISTA, for example, patients with 20/40 to about 20/63 visual acuity at entry into the study and receiving 2.0 mg aflibercept every 8 weeks (2q8) achieved 8.6- and 9.9-letter gains , respectively. Among patients with about 20/80 to 20/160 visual acuity at entry, there were 11.3- and 11.4-letter gains in VIVID and VISTA, respectively. Reproducible outcomes were also seen in both 0.3- mg and 0.5-mg treatment groups between RISE and RIDE among patients with visual acuity of 20/40 to 20/160 at entry into the trials. But, Dr. Zarbin said, reproducibility of visual outcomes seemed to be much worse in those trials among individuals with 20/200 or worse baseline visual acuity. Individuals in this category of baseline vision randomized to the 2q4 treatment group in VIVID gained 15.3 letters, but in VISTA they gained 19.9 letters. The same effect could be seen in the 2q8 treatment groups among individuals with poor baseline vision: a 20.6-letter gain in VIVID but only a 14.5-letter gain in VISTA. Dr. Zarbin emphasized that the variability in clinical outcome among patients with poor entry-level visual acuity in VIVID and VISTA and RIDE and RISE could be due to the relatively small numbers of patients in each of these cohorts (9-18, depending on the study). He pointed out, however, that even in Protocol T, where there were substantial numbers of patients with poor entry-level vision (29-37 patients per cohort, or 98 patients overall with entry-level visual acuity of 20/100 - 20/320), the variability in clinical outcome seemed greater among patients with poor entry-level visual acuity (20/100 - 20/320) compared with good entry-level vision (20/32) as judged by the whiskers of the box plot in Supplemental Figure 3A, which was published online. The variability in results in RIDE and RISE in the 0.3-mg dosing arms “makes you wonder about underdosing,” Dr. Zarbin said, adding that perhaps some of the outcomes in Protocol T may be due to a similar phenomenon. He noted that in the RESOLVE trial (a phase 2, randomized, double-masked, multicenter clinical trial involving 151 patients with DME), patients were assigned to receive either ranibizumab 0.3 mg, 0.5 mg, or sham treatment according to a PRN treatment protocol in which patients received 3 monthly injections and then additional injections as needed. Investigators were allowed to double the dose of study medication according to prespecified criteria. Analysis of the actual doses used in each treatment arm during the study showed that the average monthly dose received was 0.47 mg in the ranibizumab 0.3- to 0.6-mg cohort and 0.76 mg in the ranibizumab 0.5- to 1.0-mg cohort. These data imply, he said, that 0.3 mg ranibizumab administered with PRN posology may undertreat some patients with DME. It is interesting, Dr. Zarbin said, that by one estimate, the average monthly dose received by patients randomized to ranibizumab in Protocol T was about 0.235 mg/month. Among trials that used 20/40 visual acuity or worse as an enrollment criterion (ie, VIVID and VISTA, RISE and RIDE, and RESOLVE) there was about an 11-letter improvement in the active treatment arms despite the fact that the trials studied different drugs, had different comparators, and had other important differences in enrollment criteria and statistical analysis. Although Protocol I enrolled patients with baseline visual acuity of 20/32 or worse, there was again approximately an 11-letter gain among patients with 20/40 or worse vision. On the other hand, Dr. Zarbin said, “there is something different about the visual outcomes results observed in Protocol T compared with previous studies.” The differences, he said, may reflect a difference in the ceiling effect among enrollees to the trial compared with previous clinical trials. An interesting piece of evidence that may demonstrate this difference, he said, may be in Supplemental Figure 3A. That figure depicts visual acuity outcomes among the different drugs in patients with 20/50 or better vision that seem to be in line with data from previous studies. in Supplemental Figure 3A is greater than has been demonstrated previously in clinical trials. On the one hand, Dr. Zarbin said, this fact lends additional credence to the variability of visual acuity outcomes after treatment among patients with poorer vision. Yet, as noted above, Supplemental Figure 3A also depicts wide standard error bars. Dr. Zarbin said that in mathematical modeling looking at the ceiling effect using data points from major clinical trials (including RIDE/RISE, VIVID/VISTA, Protocol I, RESTORE, and RESOLVE), there is a strong statistically significant negative correlation between mean baseline BCVA and mean BCVA gain at month 12. If the Protocol T results are included in the analysis, the correlation between mean baseline BCVA and mean BCVA gain across the trials is no longer significant. If the aflibercept cohort of Protocol T is excluded from the analysis, however, then the negative correlation remains significant and of comparable magnitude. In other words, the aflibercept data from Protocol T seem to skew the overall correlation between mean BCVA gained in relation to mean BCVA at entry when looking at outcomes from RISE and RIDE, VIVID and VISTA, Protocol I, RESTORE, RESOLVE, and Protocol T together. 1 year among individuals with poorer baseline visual acuity, there were not statistically significant differences in mean change in central subfield thickness among these patients (-210 μm in the aflibercept group vs -176 μm in the ranibizumab group). Thus, according to Dr. Zarbin, patients could have had resolution of their anatomy but no corresponding change in visual acuity, meaning that the poor vision may have been due to some other cause (such as retinal nonperfusion) that was not addressed by the study drug. He also pointed out the reduction in retinal thickness can be associated with worse vision if the reduced thickness is due to retinal atrophy. There is no doubt that the results of Protocol T contribute significant and important data to the overall literature on the use of anti-VEGF agents in patients with DME.